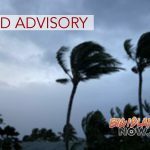 The National Weather Service in Honolulu has issued a Wind Advisory, which is in effect until noon on Monday, Feb. 11, 2019. The High Wind Warning has been cancelled, according to a NWS press released issued at 3:20 a.m.
north to northwest winds are expected briefly during the morning hours. IMPACTS Winds this strong can bring down tree branches and cause local power outages. These strong winds can cause car doors to slam and make driving difficult, particularly for high profile vehicles.